Friends in Denver had been warning me of hot weather, and a need for rain for some time before arriving. There are a number of us who “bring rain” when we travel. So we brought some. There was some talk we may have gotten carried away. My first day in Denver, it rained that glorious warm summer’s rain I remember from summers spent in Winslow. It rained in fits and spurts over the next day or two. Then Friday afternoon, while on my way from the convention center to the Sheraton, it started up again. Thunder. Lightning. Big drops of warm rain. Wonderful stuff. I took off my hat and walked with my face turned up. The rain came down harder and I was getting seriously wet. That’s ok. It’s warm. It’s summer. I’ll be fine. Then the little blighter turned cold. And mean. The rain started coming down hard enough to wash paint off buildings. It added insult to injury by hailing. Swell. Not happy with trying to wash me off the sidewalk, I am now running the risk of being shredded by little bits of ice. Fortunately I got to the bus stop just as the bus got there. There was some talk on the bus of starting a wet t-shirt contest, as there wasn’t one of us that didn’t have some water damage. That bus was a life saver, in many ways. Not just that day, but for the entire convention. Our hotels and the Convention Center were spread all over the place, and if it hadn’t been for the free shuttle down 16th Street Mall, the convention would have been a disaster. Even for someone like me who likes to walk. During the day, buses ran up and down 16th Street Mall, past shops upscale and down, “This Is Colorado” tourist kitsch, the inevitable multi-screen movie theater, stores you can find in any mall in any town, and a used bookstore I managed to avoid. For a bookaholic, that may sound like blasphemy, but my car was already suffering from “Wait! Since we’re driving, we can take…” from the trip out. Any more stuff, and I wouldn’t be able to see out the back window. LA has a pretty good set of used bookstores to get lost in. I said that loudly to myself a couple of times, as I headed away. In the evenings, the buses were joined by bicycling pedicabs dodging around the trees and seating areas in the center of the “street”, around the buses, pedestrians, and the random police car touring the town. Staying up past the time the buses ran, sometimes quite a lot after, the pedicabs made the trip back to my hotel refreshing and quite personal, kinda like a friendly taxi ride with a breeze. The drivers were willing to chat, sharing tidbits about their job and the town. Friday and Saturday nights, horse drawn carriages were also scattered about. I would have liked to ride in one, but never quite arranged it. There are convention reviews all over the net, detailing events, people, awards. I enjoyed the gathering of friends, the sharing of stories of happenings more personal. Some friends I see several times a year, some I haven’t seen in far too long, and some I met for the very first time. The party thrown by Teresa and Patrick Nielsen Hayden was a great gathering of friends in person, having gathered for months and years on the blog Making Light. Teresa made her (in)famous Scurvy Cure. Made in typical fannish fashion—in the bathroom—it consisted of hand-squoze citrus, including itty bitty limes, to which was added Everclear. A lot of drinks will numb the mouth over a few sips, so the last is milder than the first. Not so with Scurvy Cure. Between the juice and oils from the citrus and the Everclear, the last sip packed as big a wollop as the first. I told Teresa so, and got a big grin in reply. Wandering in to a party serving sloe gin gave me another alcohol first. Family history has it my grandfather took my grandmother to a speak-easy, fed her sloe gin, thus causing her memory to cease functioning for the rest of the evening. I, on the other hand, seem to have inherited my father’s head for drink, as I remember every silly, laughing moment. The same friend (hi, John) who introduced me to Rhum Agricole, rum made from sugar cane as opposed to rum from molasses, introduced me to WristRockets. Since WristRockets are legal in the UK but not in many places in the US, I of course do not have said fun thing in my possession. Any remarks made in jest about hitting everything I aim at, because I aim at the ground, does not mean anything. Really. Wandering thru the dealer room caused several items to leap off tables and racks, demanding that I take them home. Several pairs of earrings have been added to my collection, along with an absolutely amazingly beautiful hand-painted silk scarf. I avoided the art show, as it has proven more and more difficult to make it out of one without some far too expensive item, or whimpering because I can’t. I know my limitations, and art shows test them greatly. Spent time in ConOps with friends, old and new, including a crazy Brit (hi, Dave) who read the real estate advertisements with great zest and silliness. Nothing like perspective! I enjoyed pictures from Japan (hi, Robbie) and the worldcon last year. I met up with a friend who’d moved to Denver from LA several years ago (Hey Jude! ), and had a wonderful several hour chat. Sunday afternoon’s get together was both magical and wonderful, full of silliness and laughter. I’m sure the concom was delighted when the convention was over, but I was sorry to see it end. I visited the Denver Fireman’s Museum just before packing the car and heading home. UPDATE: Pictures here. A rock pile ceases to be a rock pile the moment a single man contemplates it, bearing within him the image of a cathedral. 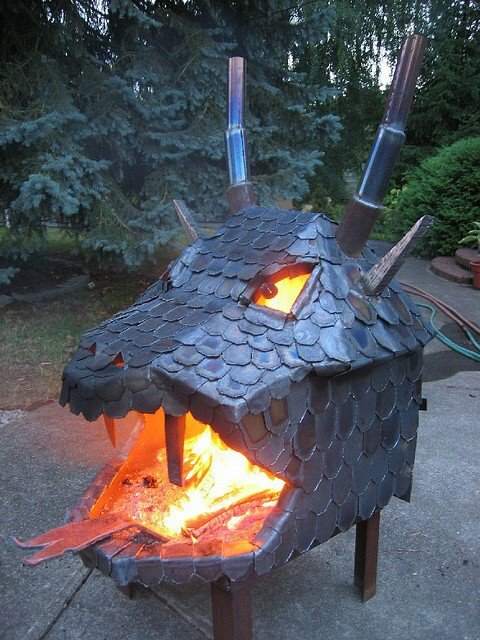 A very cool…er, hot flaming dragon firepit. I wish I knew who built this ’cause I want one.